3 Cannonball Adderley with Bill Evans Waltz for Debby Know What I Mean? One of the most subtle drummers in jazz, a man who played his kit as a melody instrument and released jazz drummers from the responsibility of keeping time for the rest of the band, Paul Motian was one of the great improvisers. He was also a consummate bandleader who delivered a wide range of styles across a variety of line-ups. He was born Stephen Paul Motian in Philadelphia on March 25, 1931, growing-up in Providence, Rhode Island, and starting to play the drums at the tender age of 12. He moved to New York in 1955 and played with some of the jazz greats — including Thelonious Monk, Lennie Tristano, Coleman Hawkins,Tony Scott, and George Russell — before making his mark on the scene in his role with Bill Evans’ most famous trio (with bassist Scott LaFaro), delivering career defining moments as shown by the two tracks that are played second and close this show – with classic gigs at the Village Vanguard in New York. In 1963, Motian left Evans’ group to join up with Paul Bley for a short period before beginning a long stint with Keith Jarrett in 1966, appearing with the pianist’s American-based quartet through until 1977. At this time Motian also played for artists like Mose Allison, Charles Lloyd, Carla Bley, and Charlie Haden’s Liberation Music Ensemble, and turned down the chance to be John Coltrane’s second drummer. In 1972, Motian recorded his first session as a leader for ECM. He formed a regular working group in 1977 (which featured tenor Joe Lovano) and recorded several more dates for ECM, then revamped the ensemble to include guitarist Bill Frisell in 1980. Further recordings for ECM and Soul Note followed, and in 1988 Motian moved to JMT, where he produced a series of albums which remain some of the most exciting in modern jazz. During the ’90s, he also led an ensemble called the Electric Bebop Band that teamed twin guitars with twin horns to create unique reworking of bop classics. In 1998, Motian signed with the Winter & Winter label and delivered another series of great albums with various line-ups. In 2005 Motian moved back to the ECM label, releasing more albums all varying the line-ups and the style of music. And from then until now he released albums both on ECM and Winter & Winter with a continuous revisiting of his work with Trio 2000, The Electric Be-Bop Band and the trio with Lovano and Frisell. He was a hugely influential drummer, bandleader, composer, and a must see live performer. Sadly Motian recently died on November 22, 2011 in New York City. He was 80 years old. This show aims to capture at least some of his great work. Paul Motian – Intro – Windmills of Your Mind (2011) – Paul Motian’s 80th birthday album with Bill Frisell on guitar and Thomas Morgan on bass for the most part takes traditional tunes and turns them inside out with Petra Haden adding vocals – however this opening track is an instrumental and demonstrates that Paul – even towards the end of his life was still stretching the boundaries. Bill Evans – My Foolish Heart – The Complete Village Vanguard Recordings 1961 (2005) – The music recorded by the Bill Evans Trio on June 25, 1961, is legendary. The influential Evans delivers a series of jazz masterpieces with bassist Scott LaFaro and drummer Motian. The interplay between the three players is stunning. Paul Motian – Last Night When Were Young – On Broadway Volume 1 (1988) – The quartet of Joe Lovano, Bill Frisell, Charlie Haden and Motian play show tunes from the 1930s and 40s, reinventing them in a fascinating fashion. The high point is the playing of Frisell, whose versatility and original sounds make this a unique set. Paul Motian Trio – Monica’s Garden – Trio I Sm (1993) – Motian has been applauded by critics for his subtle syncopation and unique sense of time. On this 1993 album, Motian’s drumming magic is complemented by the left-field guitar styling of Bill Frisell and the signature sound of saxmen Joe Lovano and Dewey Redman. Charlie Haden – Blues in Motian – The Montreal Tapes with Geri Allen and Paul Motian (1989) – the third of eight CD releases from Haden’s tribute concerts at the Montreal Jazz Festival. Haden and Motian worked together in the Keith Jarrett Trio in the 60s and 70s and have a unique understanding of each others playing. Geri Allen also raises the bar with her playing on this great live set. Paul Motian and the Electric Bebop Band- Look to the Black Wall – Holiday for Strings (2002)- the third iteration of the EBBB proved to be the more adventurous with the great dual guitar line-up on Ben Monder and Steve Cardenas adding a unique sound, and the twin horns of Pietro Tonolo and Chris Cheek adding an ambient edge. One of Motian’s greatest albums. Paul Motian and the Electric Bebop Band – Milestone – Flight of the Blue Jay (1998) – the second iteration of the EBBB only features Chris Cheek from line-up number three. Chris Potter is the other tenor player, the guitarists are Kurt Rosenwinkel and Brad Schoeppach, and Steve Swallow covers the bass duties. This is a more straight ahead be-bop recording showing the initial intent of the EBBB. 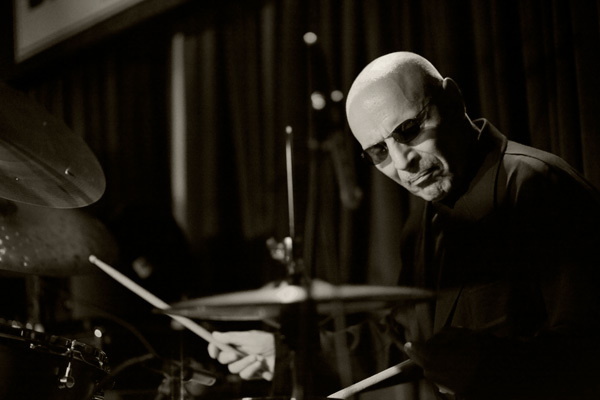 Enrico Pieranunzi with Paul Motian – Heart of A Child – Doorways (2004) – primarily a duo album between Motian and the italian master pianist but they are joined by the tenor of Chris Potter for this track. Paul Motian – Goodbye Pork Pie Hat – Garden of Eden (2006) – This set was recorded in 2004, but not released until 2006 when Motian turned 75. The band mimics the EBBB. The album focuses on bebop classics with three guitarists — Steve Cardenas, Ben Monder, and Jakob Bro — two saxophonists — Chris Cheek and Tony Malaby — and bassist Jerome Harris accompanying Motian. Paul Motian – Time Remembered – Bill Evans (1990) – Motian’s association with Bill Evans made him the right person to record an Evans tribute album, which happens to be a perfect fit with his run of jazz repertory releases in the 1990s. However this is jazz repertory re-invented as Motian, tenor saxophonist Joe Lovano, guitarist Bill Frisell, and bassist Marc Johnson deliver amazing reworkings of Evans’ tunes. A mix of old and new on this show ……. Bill Frisell & Vinicius Cantuaria – a couple of cuts from the new album “Lagrima Mexicales” – tunes that that evoke hispanic life in and around New York. Bill and Vinicius have worked together a lot – most notably on the Internationals album. What you get is the usuall Frisell wild mix of blues, country and electronic but this time with more of a latino feel. Jadid Ensemble – the new album “Sigh of the Moor” is out on March 10th and you can see them at a free concert at the Royal Exchange in Manchester at 6pm on 11th February. Follows on nicely from the Frisell with a mix of hispanic and turkish idioms. Stan Getz – Getz was known as “The Sound” because of his warm, lyrical tone, his prime influence being the wispy, mellow tone of his idol, Lester Young. He recorded continually between the 1940s and the 1990s “West Coast Jazz” – was recorded in Los Angeles in August 1955 with trumpeter Conte Candoli, pianist Lou Levy, bassist Leroy Vinnegar and drummer Shelly Manne. In 1955 the stylistic differences between East and West Coast jazz was the topic of some debate, with critics and fans arguing vehemently over the two camps . The title of the album was a joke, all musicians involved were originally from the East Coast and did not play in the laid-back, commercially profitable, cool style, as pigeonholed by some. Getz just happened to be in LA filming the Benny Goodman story. Jaga Jazzist have moved from their modernist exploration of jazz into a more progressive/post rock style since their long lay off but there are still elements of jazz in their frenetic and repetitive playing. The new latest album “One Armed Bandit” could easily find itself tucked away in a rock collection and there are definate elements of Zappa type composition in the music. Duke Ellington was the most important composer in the history of jazz as well as being a bandleader who fronted his large group continuously for almost 50 years. There is a great box set called “Masterpieces” which contains three CDs of his earlier compositions which is well worth checking out. Dennis Gonzalez is a talented trumpeter who has recorded a consistently rewarding string of lesser-known dates, his playing is somewhere in-between advanced hard bop and free jazz. The 2009 album “A Matter of Blood” is full of marvellous brooding work from Gonzalez – easily one of the darkest, most powerful albums he’s ever recorded – thanks in part to an excellent lineup that features Curtis Clark on piano, Reggie Workman on bass, and Michael TA Thompson on percussion. Led Bib – as featured on the last show another track from the new album from the young lions of the British Jazz Scene. Bill Evans – the “Conversations With Myself” album was deemed as controversial for no good reason other than the usual jazz purists getting hot under the collar because the pianist utilised the sound-on-sound technique of reel-to-reel tape recording available in the 1960s to play simultaneous twin pianos. N.Y.C.s No Lark is the sole Evans composition on the album.